I have become a fan of Brenda Novak from reading several of her more thrilling titles but with over fifty books in publication she has anything from the lighter contemporary romance to darker thrillers. Before We Were Strangers is more along the lines of a romantic suspense novel but with enough mystery to keep readers turning the pages and guessing along. In this story Sloane McBride had left home at eighteen and had not looked back for the last ten years. Sloane had her reasons for escaping her small town but they weren’t the normal dreaming of something bigger or searching for more, Sloane had wanted to escape her father who she suspected may have had something to do with her mother’s disappearance when she was five. However, Sloane had not only left behind her father and brother but also her high school boyfriend and her best friend. As much as Sloane loved them both she couldn’t stay near her father for another day which made leaving tough but returning will be even tougher since the two had turned to each other after Sloane’s absence. Having married, had a child and divorced in the last ten years Sloane isn’t sure how either will handle her return as she looks for clues from the past. 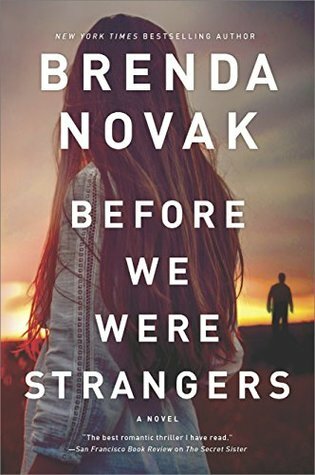 Before We Were Strangers was another Brenda Novak novel that didn’t take long at all to become completely engrossed in. Sloane’s memories of that night when she was five and her mother vanished have had her in fear that her father is a murderer. In the years that have passed her father has also gained power in the small town making getting at the truth that much more tough for Sloane but with a bit of help and determination the secrets slowly rise to the top. I will admit to being a little leery of the whole love triangle angle of the story since I’m usually not a fan of dating a friend or family members ex, again with those boundaries, however this is the creepiest, most disturbing dynamic that made the book even more compelling. There’s actually no “cheating” involved but instead this set up is even more mind games to add to the suspenseful side of the story. A great read from beginning to end that I’d definitely recommend checking out. Brenda Novak, a New York Times and USA Today bestselling author, has penned over forty novels. She is a three-time nominee for the Rita Award and has won the National Reader’s Choice, the Bookseller’s Best, and the Bookbuyer’s Best Awards, as well as many others. Sounds wonderful!! I’ve heard so many great things about this author. I need to try her out. So glad you enjoyed! Great review! Wonderful review Carrie. It is nice to find a versatile author who can go from Romantic suspense to thriller. I am glad you enjoyed this one. I have read a few by Brenda Novak, but as you said, she has so many books, I will never catch up on them all.